Product Description: The C1600 is a rugged, molded plastic case designed to carry Fluke handheld digital multimeters and process calibrators and most accessories used for these meters. Deep interior large enough to hold and protect your gear and leaves room for accessories and other essentials. Rubber gasket in lid seals out dust and keeps contents dry. Lift out tray keeps everything organized. 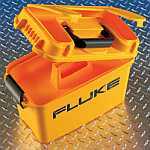 Snap open compartment on top of lid for easy access to small parts such as fuses, batteries, probes and leads. Includes five hook and loop straps to wrap cords and test leads when not in use. Large carry handle for comfortable hauling.